Normally, I probably wouldn't consider buying a valuable piece of art from anyone other than an art gallery or the artist themselves. But when I saw this soft cylinder listed on eBay's web site, I was so stricken by it that I just had to get in touch with the seller. I sent him an e-mail message requesting more information about the work, which was promptly sent. Armed with this information, I followed up with my contact at Chihuly Studio, who assured me that the work was a genuine Chihuly. (Quite a few counterfeit works of art are sold on eBay, so you have to be careful there. Caveat emptor, you know.) Over the next few days, I thought about this work quite a bit, and discussed the idea of acquiring it with quite a few people... ultimately, the seller contacted me, and I arranged to purchase the cylinder from him. This soft cylinder is simply exquisite. When Chihuly first started his soft cylinder series, the works tended to be quite small, but over time they became larger and grander in scale. This is one of Chihuly's earlier soft cylinders... but what it lacks in size (it's only 9" tall), it makes up for in sheer coolness. 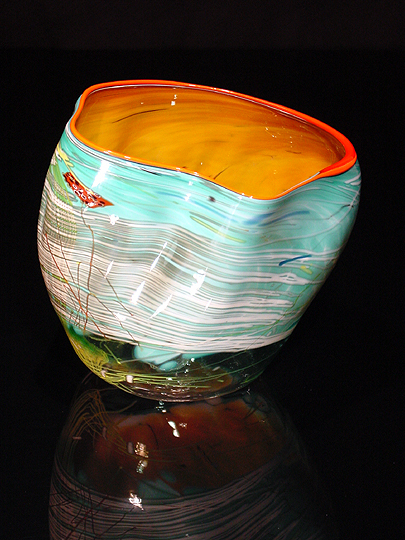 The top interior of the work is raw sienna (an orange-red-brown color which Chihuly uses quite often in his works) and the lip wrap around the edge of the work is orange. The lower part of the work is clear glass. However, the really striking feature of this work is the shard, the mostly-blue "drawing" which appears on the outer surface of the work. The shard is created by laying out glass fibres and powder on a hotplate... Chihuly employs an artist who specializes in shard creation. Once the shard has been created, a cylinder is blown and, while still hot, rolled through the shard, "picking it up" onto the cylinder. The cylinder and shard are then put back into the glory hole so that they can completely meld into each other. (If the temperature differential between the cylinder and the shard is too great, the cylinder and shard may shatter.) 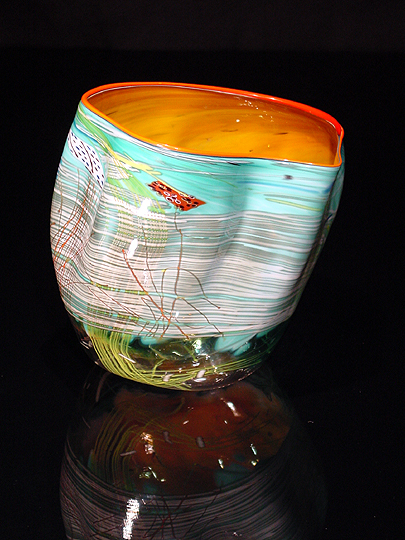 The result is an intricate design which is not painted on the glass, but which is an integral part of the work itself. As with many of Chihuly's soft cylinders, the shard resembles Native American designs used on blankets... in this case, the design is Navajo in origin. In 1999, I briefly considered purchasing a different soft cylinder, but opted instead for a second basket set (Cirrus White Basket Set with Lamp Black Lip Wrap). I'm very glad I waited... this soft cylinder is one of the finest that I have ever seen. The contrast between the blue of the shard and the orange and brown of the cylinder is simply awesome.